It was the 1980s, and parents everywhere were panic-stricken about Halloween. Children were being harmed – poisoned, cut by razor blades and other atrocities – by an unseen evil in their neighborhood that was tampering with Halloween candy given to trick-or-treaters. The news was spreading quickly via the media and word-of-mouth. Some children were kept from trick-or treating altogether. Other parents intensely examined their children’s Halloween candy. One tear or puncture in the packaging, it was tossed in the garbage. Candy bars were cut open to discover any harmful objects. Certainly, homemade treats from strangers were not allowed. Joel Best, a professor of sociology and criminal justice at the University of Delaware, observed this growing concern and wanted answers. What he found next was shocking: none of it was true. That’s right, none of it. It’s true that parents were panicked and children had to sit through lengthy candy inspections, but for no good reason – candy tampering was an urban legend. How could this have happened? This urban legend is the result of a perfect storm comprised of hearsay, the media not doing its job to report the facts, and other related stories about tampering that occurred around that same time (such as the Tylenol case in the ‘80s). These all came together to create the story of malicious threats to our children. It was not the first time in history a storyline like this would take off, and it’s not the last. Since then, trick-or-treating has been relegated to “safer” environments in many cases, like malls across America. In other words, an entire cultural shift has occurred that’s rooted in the fear of strangers and the safety of our children. This urban legend is not unlike the one we tell our co-workers and ourselves about the perceived limited skills of our hospital service teams. Hospital service teams are good at one thing: cleaning, stocking, or serving food – they certainly can’t handle advanced technology and that’s why no one even bothers entertaining the idea. If you believe in this legend, you’re selling your team short and leaving money on the table. That’s because good technology paired with streamlined operations enables performance improvement. To reap the benefits, you need to move past that urban legend to create a positive cultural shift that allows you and your hospital to trust service teams with technology. Have you taken the time to get to know your service team members on a personal level? What you find out may surprise you. These workers do their jobs, day in and day out, often quietly and going unnoticed. But, I’ve always been impressed with the diversity of hospital service teams. In my experience and in talking with other hospital leaders, what I’ve learned is that everyone has had their own unique path that brought them to their work at the hospital. On one occasion, he was working the floor and a patient needed a French translator. The building services worker overheard, stopped him, and offered to translate, which he did beautifully. My colleague later learned that he not only spoke English and French, but six more languages as well! In another example from my time at University of California-San Francisco (UCSF) Health, I learned that one of our environmental services (EVS) technicians was a physician in his home country! Upon arriving to America, he had to start from the ground up, and that’s what brought him to his current job in EVS. The takeaway: Ask your staff about their backgrounds … you’ll be amazed at what you find out. The Pygmalion effect says that higher expectations lead to increased performance (whereas the Golem effect is lower expectations lead to lower performance). Self-fulfilling prophecies are real, and there’s plenty of research to back that theory up. As the UCSF Health Mission Bay campus EVS department was adopting ReadyList technology to improve hospital room turnover, team members were concerned about one member on the team in particular: a 55-year-old woman for whom English was her second language … everyone assumed she would not be able to figure out the application. However, management put its faith in her capabilities. As part of training, a super-user shadowed her for a day and showed her how to use the technology. After that, she worked every day at every aspect of the system, and this staff member ended up being the most proficient user of the technology. In another scenario, we saw a 90 percent adoption of the ReadyList application at NYU Langone Health in its EVS department within two weeks – pretty amazing for a group of people who are supposedly technologically challenged. The takeaway: If you believe in your teammates, they will believe in themselves and you will begin to see surprising results. Seventy-seven percent of Americans have a smartphone (aka a mini computer in their pocket), according to Pew Research Center. If someone owns and can operate a smartphone, he or she likely has the skills to adopt technology in the workplace. I was reminded of this during a training session for the ReadyList application at NYU Langone Health for an EVS team. The managers in the room were setting the tone, questioning if the team would be able to grasp the technology (mind you that the ReadyList application is accessible via a mobile phone). Then something happened at the most opportune time: an emergency alert went off, and almost everyone took a mobile phone out of their pocket or bag to silence it. That was a brilliant “a-ha” moment for everyone in the room. The truth is that good technology is usable by everyone – just think about the Google Search engine or Amazon’s marketplace. In fact, about 48 percent of the millions of Facebook users in the United States are over the age of 55. The takeaway? Technology bias can creep in and discriminate against age, race, economic class and more, but in today’s world, technology is pervasive – nearly everyone can use technology designed for the masses. Have you bought something on Amazon? Do you have a personal email address? You’ll be surprised at how high your team scores. Given their familiarity with basic technology, your staff is ready to embrace tech in the workplace, provided the technology is designed with a good user experience in mind. By doing this, it will open up doors to other technologies available to you that can improve performance even more. 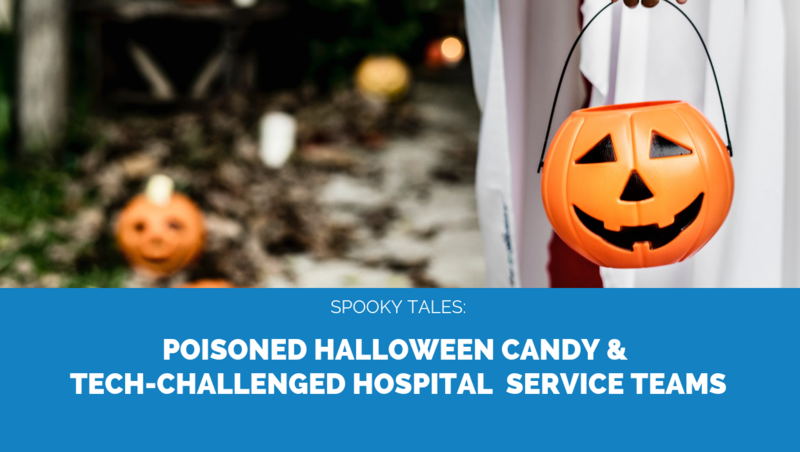 Like the Halloween candy legend, the stories we tell ourselves about the capabilities of our hospital service teams can deeply impact our actions. If we take a moment to identify where misinformation may be creeping in, we can correct our course of action before it takes away opportunities that can create richer experiences in the hospital.